Fill a high-sided skillet or large pot with 6 cups water; add celery, scallion whites, and lemon slices to pot. Add 1/2 teaspoon salt and 1/2 teaspoon pepper. Bring to a boil over high heat; cover, reduce heat, and simmer. Cook until fragrant (8-10 minutes). Add salmon (water should just cover fillets) to pot; cover and gently simmer until fish is opaque (5-8 minutes). 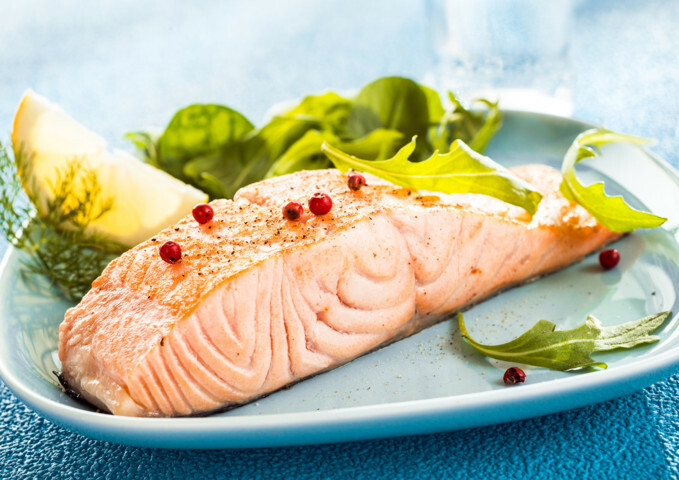 With tongs or a fish spatula, remove salmon from broth; set aside on a cutting board to cool. While fish is poaching, make the dressing: In a medium bowl, combine yogurt, chopped dill, horseradish, lemon zest, lemon juice, oil, 1/2 teaspoon salt, and 1/4 teaspoon pepper, whisking well. Arrange watercress, snap peas, radishes, and dill fronds on 4 plates; top with salmon, and sprinkle with scallion greens. Drizzle with dressing; serve.